Roasted vegetables are one of the simplest side dishes that complete many a main course. I love the naturally sweet flavor that shines through when the organic rainbow carrots are roasted. Delicious! Add or substitute other vegetables to develop a dish you know your family will love. Serves about 6-8. In a large bowl combine all the prepared vegetables and thyme. Add the olive oil and balsamic, then season to taste with salt and pepper. Toss the mixture well to coat all the vegetables. If needed, add a TBL or more of olive oil. Spread the vegetables out in a single layer on a rimmed baking sheet and place in the oven. 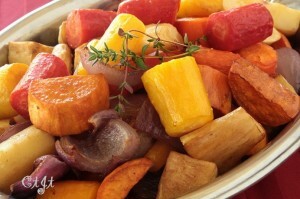 Roast, flipping once, for 35 to 40 minutes or until tender and lightly browned.